Interstate 95 North, past Portland. From Interstate 95, Take Exit 63, Gray, Maine. At end of ramp, turn right and stay to the left as you approach the next stop light. At stop light, turn left and left again at next stop light. You are now on Route 26. Go North 8 miles on Route 26 to Poland, Maine. The center of town is a crossroad and a small convenience store on the left. Continue straight on Route 26. Continue North for a 1 mile to an island in middle of the road and Poland Regional High School on your left. After passing the island in the road, Poland Mining Camps driveway entrance is on the Right (wooden sign with light blue posts). There is a street sign saying "Groves Lane." Drive toward the back of the campus until you come to the Pavilion, a large, red, single story building with a metal roof. You are here! From Norway - South Paris, Maine, Route 26 South to Route 11. Continue south on Route 26, 300 yards, to an island in the middle of the road. 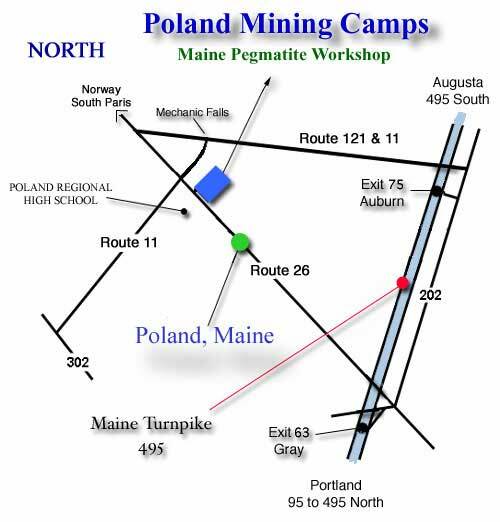 Poland Mining Camps driveway entrance is on the Left (wooden sign with light blue posts).